Automated cubing and dimensioning equipment is emerging as a necessary capital investment for companies across the supply chain, and as such, professionals from various backgrounds – operations, IT, management and accounting – are beginning their first rounds of research into the available products, and the companies that produce them. However, to truly understand the distinctions in these commodities and determine which product is right for your business, it’s helpful to first understand the differences between the base technologies being used. Infrared 3D sensors have two primary components – an infrared (IR) projector and an infrared (IR) camera. The IR projector shoots out a blanket of IR light in the form of thousands of dots or points, which are invisible to the human eye as they lie on the infrared spectrum. 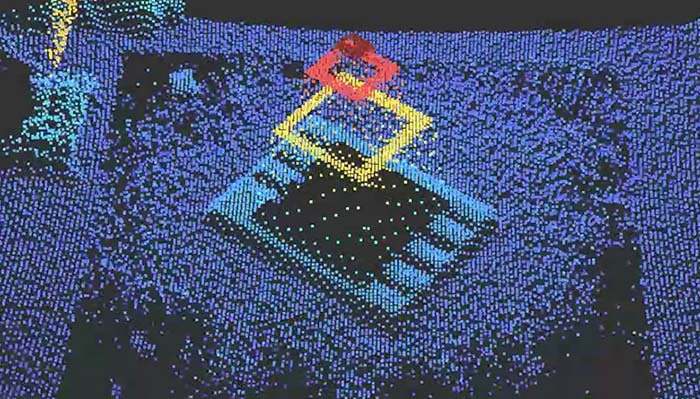 The IR camera sees these points then sends the video feed of them to a processor, which creates a depth map that can be used to calculate the measurements of objects in three dimensions – length, width and height. On the other hand, laser sensors used in pallet and parcel dimensioning applications typically use the phase shift method of laser measurement. In this case, laser sensors emit a constant beam of laser energy directed at a target. The reflected light is monitored and the phase of power modulation is then compared with the baseline power modulation of the sent light. Calculations are then performed, which can determine the dimensions of the targeted object. While these technologies are fundamentally different in the way they work, both collect incredibly accurate measurements. In fact, of the four major pallet dimensioners on the market, the three using laser-based technologies are certified to measure within a half of an inch, while the one dimensioner using infrared technology, FreightSnap’s FS 5000, is certified to measure within a quarter of an inch. What Are The Notable Differences Between Infrared Dimensioners And Laser Dimensioners? As noted, in terms of performance, today’s cubing systems are comparable. The real differences in dimensioners come down to price and integration. Currently, 3D laser sensor technologies are more expensive to implement than their infrared counterparts, making laser-based dimensioners significantly more expensive to build – a cost that ultimately gets passed on to consumers. Alternatively, the lower cost of infrared 3D technologies allows companies using them to keep the price of their final product lower. Today, a dimensioner like FreightSnap’s FS 5000, which uses infrared technology, can cost as little as a third of the price of other laser-based pallet cubing solutions. Integration is a principle concern for companies purchasing new capital equipment – and for good reason. How will this new product integrate with my current operational processes and warehouse equipment? Will this solution work with my existing WMS or TMS systems? Can I use the data collected by the dimensioner in a way that makes sense for my business? These are all important questions to ask before deciding on a dimensioner. For our part, FreightSnap dimensioners offer the option to integrate with other warehouse equipment like floor scales, forklift scales, pallet wrappers and barcode scanners. Additionally, data collected by our dimensioners can be custom integrated with most WMS and TMS systems, or parsed according to your company’s needs. As cubing and dimensioning technologies continue to become more important across the supply chain, it will be helpful for those in charge of purchasing decisions to become familiar with the differences and similarities in products. Both infrared and laser based dimensioners offer near equivalent performance capabilities, while cost and integration options highlight the key distinctions. Cubing systems like the FS 5000, which utilize infrared 3D sensor technology remain far less expensive than other laser based solutions in the current marketplace.